Hello Ladies, I'm back with another beauty event report. Last week I was invited to attend the grand opening of Laneige counter at Tunjungan Plaza Surabaya. For those who love korean brands, maybe already familiar with this brand, Laneige. It is quite popular for their water bank series (essence and sleeping pack) and also the cushion. Laneige means "Snow" in french, it offers a wide range of skincare and makeup products that suit most skin types and for various skin concerns including sensitive skin. Laneige already had 16 counters at Jakarta, Bandung, and Surabaya (at Sogo Dept Store Tunjungan Plaza) and now they opened their 17th counter at Matahari Dept Store. The Grand opening took place at Matahari Dept Store Tunjungan Plaza, on May 14th (which is a public holiday so I can attend the event yay~). At that time, Matahari Dept Store also having a Great Beauty Bazaar at the atrium, so it is really crowded~ Here is the picture of the beauty fair. I snapped it from above. Laneige Counter~ they also offer a free consultant and provide a MUA to help the customer. Now, let's move on to the counter. When I came in to Matahari, the others are already there and busy trying the products. I registered myself first with Yennyca (whom I met at Daiso~) and also greeted Nia the one who sent me the invitation. And then, I was busy taking pictures. At 2.00 p.m , the representative (Ms Nia) called us to gather around and start the grand opening ceremony. The opening speech presented by Ms Dian (Laneige's Brand Manager) and then they continue the event with cutting the ribbon. There are 3 persons that honoured to cut the blue ribbon as a symbol of the grand opening. As the blue ribbons cutted, it is official. The Laneige Counter is now open!! 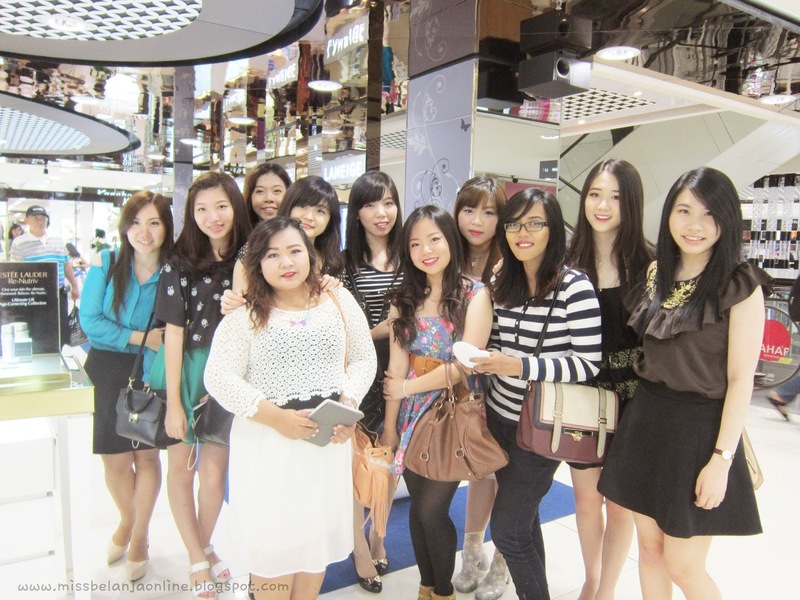 Yay~ then we were directed to the atrium to watch a live makeup demo from Laneige. The model of the makeover is our beautiful Oline~ The theme is Korean Glam Party Look. Before apply a lipstick, it will be better to use a base on your lips. In this case, the MUA used Laneige Snow BB Cushion as a base (yes, it is very multifunction product). Why we must use a base? The first reason that we already know is to make the color more visible and long lasting. But, It is also used to prevent the color of the lipstick absorbed into our skin, because it will makes our lips looks dark. Don't forget to clean your lipstick properly too with lips remover. Some people tends to neglect the lips area because they think the lipstick will already dissapeared when we eat heavy foods, but we still need to clean it. Final Result~ She looks so cute and fresh. I fell in love with the cushion and the lip tint. It has a very nice color! Thank you so much Laneige Indonesia for the Invitation. I wish all the best for the bussiness! I have so much fun at the event with my fellow bloggers.